Couldn't win me the champion's cup actually. Do you know who has all the winning tools? Who is the champion - the best under the sun? He makes us play moves & learn along the way. Opportunities come dressed as challenges in our fate. Winning tip- Be/Feel/Behave like a champion everyday! Have you ever wanted to be a champion? Wish to succeed in what you choose? With a champion's spirit, you can never lose! Do you aspire to be or consider yourself to be a champion? I'm participating in my maiden #AToZChallenge. 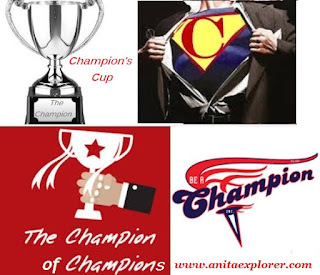 C For - Champion, Cup, Challenge, Carefully. I feel like it is God - the ultimate Champion!! Glad you liked it, Anks. Not yet. But I do aim to be a champion in certain aspects some day in my life. You are already a champion, Doc! Let's keep going & we'll get there! Aditya Sathe C has to be for Coffee #AtoZChallenge"
Bowed on an auspicious day, Aditya! Today is Ram Navami. Life is a game with info/guides none. Dropped by from the AtoZ. Yes indeed. Being in the game with a champion's spirit & attitude is great, Shilpa. Cheers for the indomitable spirit! I am still aspiring to be a champion. Inspiring poem.